This article is about artistic painting. 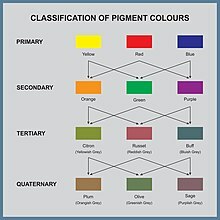 For other uses, see Painting (disambiguation). "Painter" redirects here. For other uses, see Painter (disambiguation). Painting is the practice of applying paint, pigment, color or other medium to a solid surface (support base). The medium is commonly applied to the base with a brush, but other implements, such as knives, sponges, and airbrushes, can be used. 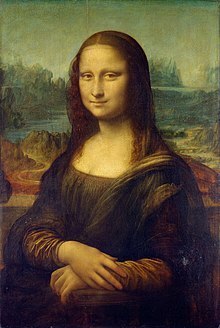 The final work is also called a painting. 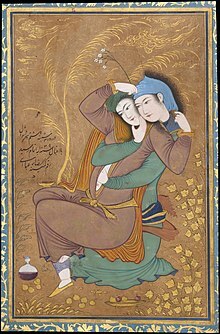 A portion of the history of painting in both Eastern and Western art is dominated by religious art. Examples of this kind of painting range from artwork depicting mythological figures on pottery, to Biblical scenes Sistine Chapel ceiling, to scenes from the life of Buddha or other images of Eastern religious origin. In art, the term painting describes both the act and the result of the action. The support for paintings includes such surfaces as walls, paper, canvas, wood, glass, lacquer, pottery, leaf, copper and concrete, and the painting may incorporate multiple other materials including sand, clay, paper, plaster, gold leaf, as well as objects. 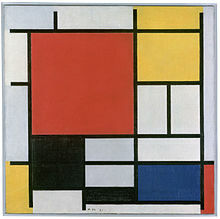 Rhythm, for artists such as Piet Mondrian, is important in painting as it is in music. If one defines rhythm as "a pause incorporated into a sequence", then there can be rhythm in paintings. These pauses allow creative force to intervene and add new creations—form, melody, coloration. The distribution of form, or any kind of information is of crucial importance in the given work of art, and it directly affects the aesthetic value of that work. This is because the aesthetic value is functionality dependent, i.e. the freedom (of movement) of perception is perceived as beauty. Free flow of energy, in art as well as in other forms of "techne", directly contributes to the aesthetic value. Music was important to the birth of abstract art, since music is abstract by nature—it does not try to represent the exterior world, but expresses in an immediate way the inner feelings of the soul. Wassily Kandinsky often used musical terms to identify his works; he called his most spontaneous paintings "improvisations" and described more elaborate works as "compositions". Kandinsky theorized that "music is the ultimate teacher," and subsequently embarked upon the first seven of his ten Compositions. Hearing tones and chords as he painted, Kandinsky theorized that (for example), yellow is the color of middle C on a brassy trumpet; black is the color of closure, and the end of things; and that combinations of colors produce vibrational frequencies, akin to chords played on a piano. In 1871 the young Kandinsky learned to play the piano and cello. Kandinsky's stage design for a performance of Mussorgsky's "Pictures at an Exhibition" illustrates his "synaesthetic" concept of a universal correspondence of forms, colors and musical sounds. Music defines much of modernist abstract painting. Jackson Pollock underscores that interest with his painting Autumn Rhythm. Iconography is the study of the content of paintings, rather than their style. Erwin Panofsky and other art historians first seek to understand the things depicted, before looking at their meaning for the viewer at the time, and finally analyzing their wider cultural, religious, and social meaning. A work of art seeks to hold your attention and keep it fixed: a history of art urges it onwards, bulldozing a highway through the homes of the imagination. Different types of paint are usually identified by the medium that the pigment is suspended or embedded in, which determines the general working characteristics of the paint, such as viscosity, miscibility, solubility, drying time, etc. 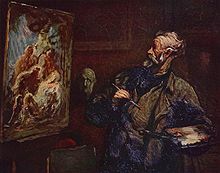 Honoré Daumier (1808–79), The Painter. Oil on panel with visible brushstrokes. 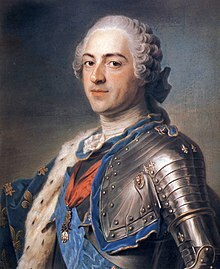 Maurice Quentin de La Tour, Portrait of Louis XV of France. (1748) Pastel. 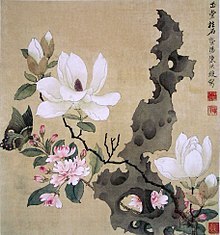 Landscapes of the Four Seasons (1486), Sesshū Tōyō. Ink and light color on paper. 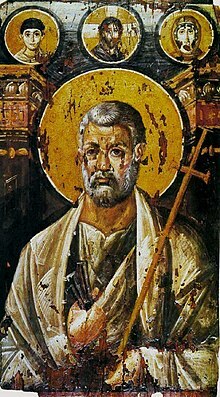 A 6th-century encaustic icon from Saint Catherine's Monastery, Egypt. 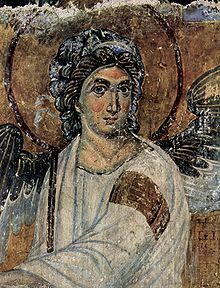 The technique was the normal one for ancient Greek and Roman panel paintings, and remained in use in the Eastern Ortodox icon tradition. 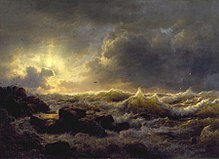 Clearing Up, Coast of Sicily, a painting by Andreas Achenbach, who specialized in the "sublime" mode of landscape painting in which man is dwarfed by nature's might and fury. – 1847  The Walters Art Museum. ^ "Paint – Definition". Merriam-webster.com. 2012. Retrieved 13 March 2014. ^ Perry, Lincoln (Summer 2014). "The Music of Painting". The American Scholar. 83 (3): 85. ^ Wassily Kandinsky Concerning The Spiritual In Art, [Translated By Michael T. H. Sadler, pdf. ^ "Wassily Kandinsky - Quotes". 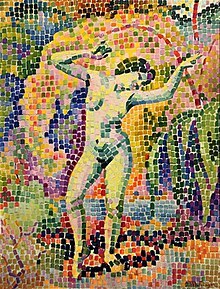 www.wassilykandinsky.net. Retrieved 17 September 2016. ^ Fiedler, Jeannine (2013). Bauhaus. Germany: h.f.ullmann publishing GmbH. p. 262. ISBN 978-3-8480-0275-7. ^ "How Old is Australia's Rock Art?". Aboriginalartonline.com. Retrieved 13 March 2014. ^ "Milhares de pinturas rupestres são descobertas em cavernas no México". BBC News Brasil (in Portuguese). 23 May 2013. ^ "Plato's Aesthetics". www.rowan.edu. Retrieved 1 October 2017. ^ Craig, Edward. Routledge Encyclopedia of Philosophy: Genealogy to Iqbal. Routledge. 1998. p. 278. ISBN 978-0-415-18709-1. Retrieved 13 March 2014 – via Books.google.com. ^ "Review by art historian David Cohen". Artnet.com. Retrieved 13 March 2014. ^ Bell, Julian (2007). Mirror of the World: A New History of Art. Thames and Hudson. p. 496. ISBN 978-0-500-23837-0. ^ Mayer, Ralph,The Artist's Handbook of Materials and Techniques, Third Edition, New York: Viking, 1970, p. 312. ^ Cohn, Marjorie B., Wash and Gouache, Fogg Museum, 1977. ^ Mayer, Ralph,The Artist's Handbook of Materials and Techniques, Third Edition, New York: Viking, 1970, p. 375. ^ Mayer, Ralph,The Artist's Handbook of Materials and Techniques, Third Edition, New York: Viking, 1970, p. 371. ^ "What is digital painting?". Turning Point Arts. 1 November 2008. Retrieved 17 May 2017. ^ Barth, John (1979) The Literature of Replenishment, later republished in The Friday Book'(1984)'. ^ Graff, Gerald (1975) Babbitt at the Abyss: The Social Context of Postmodern. American Fiction, TriQuarterly, No. 33 (Spring 1975), pp. 307–37; reprinted in Putz and Freese, eds., Postmodernism and American Literature. ^ Gardner, Helen, Horst De la Croix, Richard G. Tansey, and Diane Kirkpatrick. Gardner's Art Through the Ages (San Diego: Harcourt Brace Jovanovich, 1991). ISBN 0-15-503770-6. p. 953. ^ Key, Joan (September 2009). "Future Use: Abstract Painting". Third Text. 23 (5): 557–63. doi:10.1080/09528820903184666. ^ Boddy-Evans, Marion. "Art Glossary: Action Painting". About.com. Retrieved 20 August 2006. 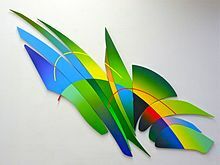 ^ Lindey, Christine Superrealist Painting and Sculpture, William Morrow and Company, New York, 1980, pp. 27–33. ^ Chase, Linda, Photorealism at the Millennium, The Not-So-Innocent Eye: Photorealism in Context. Harry N. Abrams, Inc. New York, 2002. pp. 14–15. ^ Nochlin, Linda, The Realist Criminal and the Abstract Law II, Art In America. 61 (November – December 1973), P. 98. ^ Droste, Flip (October 2014). 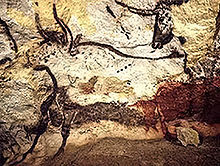 "Cave Paintings of the Early Stone Age". Semiotica. 2014 (202): 155–165. doi:10.1515/sem-2014-0035. ^ "Clearing Up—Coast of Sicily". The Walters Art Museum. 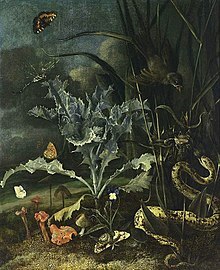 Wikimedia Commons has media related to Paintings. Look up painting in Wiktionary, the free dictionary.